On February 5, 2019, the presidents of Maryland’s independent colleges and universities, including Mount St. Mary's University, bestowed the prestigious Presidents’ Award to Maryland’s U.S. Senator Chris Van Hollen for his unparalleled leadership and remarkable public service in support of higher education. The presentation took place on Capitol Hill in the Hart Senate Office building. The Presidents’ Award was established by the Maryland Independent College and University Association (MICUA) to recognize exceptional leaders who have made impactful contributions to college access, student success, and the advancement of knowledge. Over the past 50 years, the award has been presented sparingly to eight esteemed leaders who have distinguished themselves as champions of higher education. As an elected official, Senator Van Hollen has advanced policies that expand college access, promote student choice, and improve student success. As an appropriator, Senator Van Hollen has supported investments in student financial aid, higher education research, and technology developments. 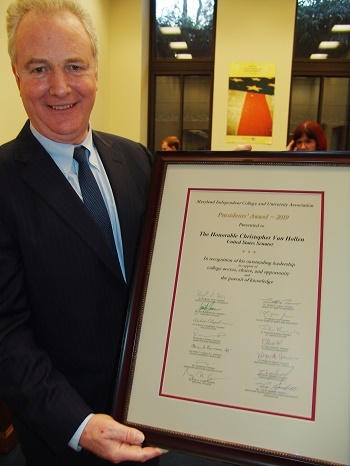 The MICUA presidents presented Senator Van Hollen with their highest award in recognition of his past actions, effective leadership, and commitment to private, nonprofit colleges and universities. Senator Van Hollen has served as Maryland’s junior U. S. Senator since 2017. He formerly served fourteen years in the U.S. House of Representatives and twelve years as a member of the Maryland General Assembly. Senator Van Hollen is a graduate of three independent institutions - Swarthmore College, Harvard University, and Georgetown University.